Every Christmas morning for our children’s lives our house would fill with the sweet perfume of cinnamon and nutmeg and caramelizing apples. Every Christmas morning, the girls’ eyes, and later on, the boy’s, would pop at the big puff of a pancake as it came from the oven. (It’s a bit of a wonderment really.) From the oven, I’d slip it onto a warm platter and then – into the golden heart of it a steaming skillet-ful of glistening caramelized apples would tumble. I think it’s become impossible for any of us now to separate Christmas morning from the pancake. As true as that is, we enjoy this special breakfast too much to relegate it to one morning a year. It manages to show up at birthday breakfast tables by request, and occasionally it appears just because someone’s in need of a little extra lovin’ or an atta-boy or -girl! This year we’ll bring it the New Year’s table too. It’s how our family celebrates with breakfast. So disappointed I forgot to include the cranberries for this one – it’s positively beautiful with them. Place an oven rack in the middle position. Preheat the oven to 500°F. Into a blender (or food processor) break 3 eggs. Add milk and vanilla, and process for about 30 seconds. Add the flour, salt and sugar and process until lumps are gone, about 15 seconds. (Don’t overmix.) Allow to “bloom” – for flour to absorb the liquids completely – at least 15 minutes, and as long as overnight. Briefly mix again before pouring in the pan. With oven at 500°F, melt 1½ Tablespoons butter in a heavy skillet over medium heat- cast iron works very well for this. When the butter has turned to foam, swirl it around the bottom of the pan, and slightly up the sides. Pour in the pancake batter and place the pan in the oven. Promptly lower the heat to 425°F. Cook for 10 minutes at this setting, and then lower the heat to 350°F and cook for about 15 minutes longer. (If during the initial stages of the baking, the center of the pancakes bubbles up and forms a little mountain, pierce it with a long handled fork. No worries if it doesn’t completely flatten though because the apples will take care of most of that.) Like magic, the sides of the pancake will rise up and form a bowl. While the pancake is baking prepare the apples. Peel and core the apples. Cut into ¼-inch slices. Melt ¼ cup butter in heavy skillet. (You’ll get better caramelizing results if you don’t use a non-stick pan.) Add the brown sugar and melt together. Add the apples and spices. Stirring fairly continually over medium heat for about 10 minutes, caramelize the apples. During the last 3 or 4 minutes of cooking, add cranberries if using. Remove the pan from heat when apples are cooked through and some are beginning to brown. You want them to still gently hold their shape. Pre-warm your platter by pouring boiling water over it a couple minutes before serving. To serve: Lift or slide the pancake onto a platter, tumble the prepared apples inside, dust with a sprinkling of sifted powdered sugar. Cut into wedges. This is wonderful looking, I can see why it’s a favorite. I LOVE THIS! And this year’s addition of cranberries was fantastic. 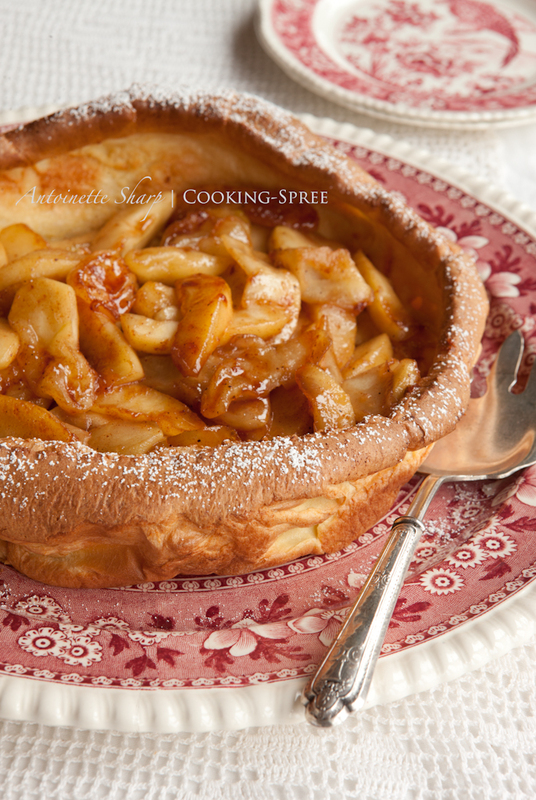 As I remember, too, Mama, when you were beginning to share recipes and the stories that accompany them — pre blog — this special German Apple Pancake was among the first offerings to Ali and me. I so love this tradition. The smells. The tastes. The puff of pancake. The drippings of apples. The look of the skillet holding the treasure before it’s arranged beautifully on a platter. Each and every part a treasure intermingled with the joy of Christmas and celebration. Love the story and the tradition – and a wonderful recipe too. It reminds me of a sweet yorkshire pudding, delicious! VERY much like Yorkshire pudding, yes! 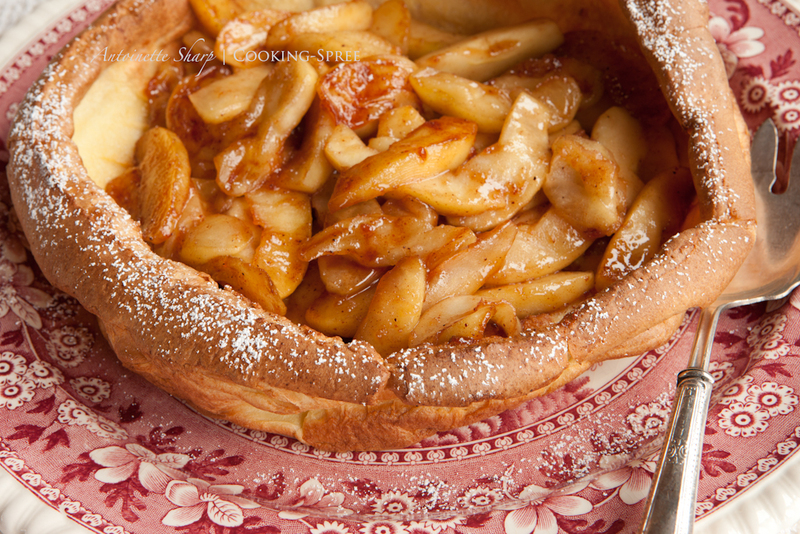 I have heard of a German apple pancake but have never had one. I’m going to have to remedy that real soon…you photo makes it look delicious. This looks just incredible! I very much prefer apples with breakfast over all other fruit and I would have begged relentlessly for a breakfast of these. I’m with you on apples for breakfast, John. And you wouldn’t have had to beg long around our house! I have never seen anything like this before, but it looks delightful! Without a doubt, my ALL-TIME FAVORITE breakfast!!! I too, loved the addition of cranberries this year!! Thanks as always, for putting love on the table!! This looks delicious, and I will be making it one of these weekends. As you might tell from my photo, I’m rather fond of apples :). In fact, I just wrote today about a Flemish fried egg and apple breakfast that my mother used to make for us when we were kids; such a treat to have it again after all these years. I’m enjoying following your beautiful blog. Cheers! I think it looks great even without the cranberries. Thank you for sharing. This looks lovely. I love any food with the word “German” attached! Only just seen these on Foodpress, they look amazing, I might have to sneak a dollop of cream on top even for breakfast! Found this recipe a few weeks ago, and made it three times since! An instant succes with my family and friends, yet so easy to make :). I don’t have a skillet that can go in the oven, so I made it in a pie dish that I had preheated with the butter. Works just as well!